The Utah Legislature’s 2016 budget included a $150,000 appropriation for the Utah Department of Environmental Quality (DEQ) to create a pilot program to screen for leaks of volatile organic compounds (VOC) primarily coming from the “thief hatch” on oil and gas-condensate storage tanks. DEQ proposed a partnership agreement with the Tri-County Health Department and the Bingham Entrepreneurship and Energy Research Center to carry out a field program to assess emissions that are not currently accounted for in the Division of Air Quality (DAQ) emissions inventory. Air quality scientists at DAQ developed and managed a pilot program that built upon technology and experience already within the Division. This includes a tablet-based GIS application developed under a grant from the EPA, as well as the Google high-resolution imagery purchased by the State of Utah with a previous legislative appropriation. 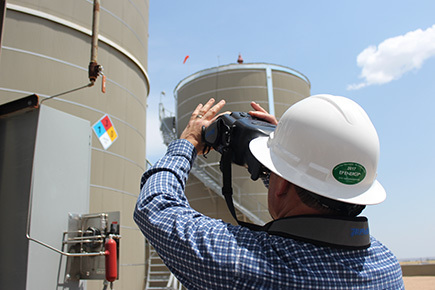 This project made use of DAQ’s infrared cameras for observing natural gas leaks, and data from a new emissions inventory created through a collaborative effort between DAQ and the Western Energy Alliance.